It’s finally time to take the wraps off our new fall + winter pattern collection. 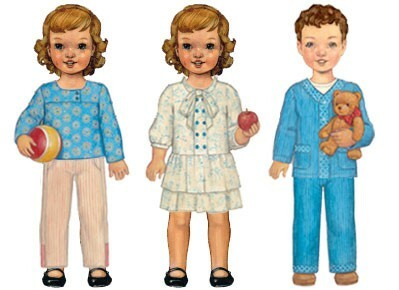 This season, we are releasing three new patterns: two outfits for girls and a unisex pajama set. The After-School Shirt + Pants pattern creates the perfect after-school outfit for girls. It features a loose-fitting pull-on shirt with long sleeves, a bateau neck, and a cute offset button detail at the front and back yokes. The pull-on elastic-waist pants include a separate side panel which allows for use of a contrast trim near the hem. An alternate view of the pants includes ruffle details at the front pocket opening and at the back. The Apple-Picking Dress includes a wide button placket, a bow at the neck, bias-bound sleeves, and a dropped waist for a vintage feel. View A has three-quarter length sleeves and a double-layer gathered skirt, while view B is long sleeved with a single-layer skirt. It makes a perfect dress for the transitional fall season. The Sleepover Pajamas pattern is intended for both boys and girls. The top is inspired by vintage baseball jersey styling and features contrast trim at the outside edge and on the pockets. The cuff at the sleeves can be let down as the child grows. The elastic-waist pull-on pants have no side seam for extra sleeping comfort and include contrast bias trim at the hem that can also be let down as the child grows. The pattern includes an alternate view with ruffles on the top and pants for making a sweet little girls’ version. The patterns will be available in stores worldwide and on our website during the first full week of September. Be sure to sign up for our newsletter to be notified when the patterns become available. Wholesale customers can place pre-orders now by downloading the form from our Wholesale page. Over the next few weeks we’ll be publishing more detailed posts here that highlight all the options included in each pattern. Check back frequently to see what we have in store for you this season. Photographs by our friends at BPD Studios. Yay! Now I can post pics of the Apple Picking Dress! It was SO much fun to test this patten and we get lots of compliments on it. I can’t wait to sew the Apple Picking dress! I designed a knitted vest for apple picking. The ethos must be in the air! Hope you are well. Love them! Can’t wait to make some! What will the be the size range for the patterns? They’re all lovely. Sabrina, these will be released in our standard two size ranges: 6M-4 and 5-12. Any reason the shirt and pants aren’t unisex? I can totally see the pants in a brown pinwale cord and the shirt in a woven flannel small check for a boy??? These look like they’re going to be great but it’s kind of hard to tell because of the white background in the pictures. I’m excited for the jammies in particular! Love, love the Apple-Picking Dress. Timeless. Classic. My daughter is only 8 weeks old, but I’m going to make it anyways. I’m thinking next year early fall, white cotton with rosey pink polka dots. Love the dress soooo much! I would put the After School ensemble on a boy in a second! I was disappointed not to see a boys’ outfit in the fall collection, but I think the After School look would be just fine on a boy with the right fabrics! I cannot wait to get these jammies!